When it comes to urban transportation policy, Americans often look longingly across the Atlantic. Paris pioneered big-city bike-sharing, London showed New York that congestion pricing works, and Sweden set the goal of eliminating traffic deaths. But here’s a case where New York is leading a peer city overseas. In 2009, London Mayor Boris Johnson unveiled a plan to install 12 “cycle superhighways” criss-crossing the capital. But Londoners found the new bikeways wanting: narrow painted bike lanes on high-traffic streets, without any protection from passing drivers. One of the cycle superhighways runs across a busy roundabout in East London that’s been the site of two cyclist fatalities since the route was installed. Not surprisingly, the lanes have a poor reputation, and the number of people riding bikes in London last year fell for the first time in a decade. Transport for London recently announced that it would install a protected bike lane on the East London roundabout approach. Though advocates want additional tweaks, the plan is a shift in policy. “You can expect to see more of these designs across the capital,” explained BBC reporter Tom Edwards, though a TfL official cautioned that the protected lanes will not be everywhere, particularly in central London. While Dutch and Danish cities are still way ahead of London and NYC, it seems like NYC DOT’s protected bike lane designs are now the object of some international envy. The proposal is “the first time I’ve seen anything even vaguely close to catching up on what’s already common-place in New York,” wrote Danny Williams at Cyclists in the City, a London bike blog. 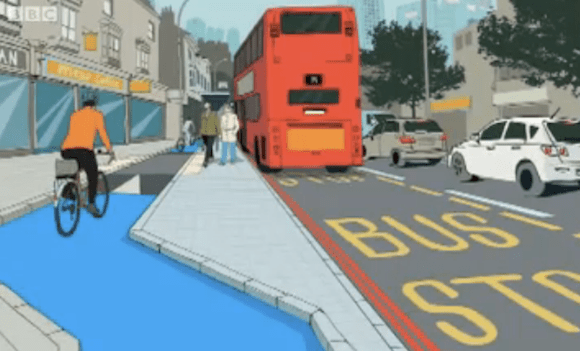 The protected bike lane proposed in London will include an element we haven’t seen yet in New York: a bikeway that runs between the sidewalk and a “floating” bus stop. On streets with major bus routes and protected bike lanes, NYC DOT has opted to put bikes and transit on opposite sides of the street. First Avenue has this configuration even though it leads to more conflicts between cyclists and turning traffic (there are more drivers turning left, across the bike lane, than turning right). It will be interesting to see how the floating bus stop works out for London, and whether it becomes a treatment in the New York City toolbox too. I moved in August from London to New York. I cycled 11 miles a day in London and normally 18 miles a day in New York. http://invisiblevisibleman.blogspot.com/2012/09/farewell-to-london-where-cyclings.html) the cycle-specific infrastructure but that there’s so much more traffic calming. When one’s in the general traffic in New York, the vehicles don’t tend to give one space. Traffic speeds in New York are also generally higher. While I certainly had complaints about attitudes in London, there were more drivers willing to give cyclists space – and few places where cars could reach really high speeds. The Cycle Superhighways are generally bad news, however. London was developing a good network of cycle routes along quiet back streets until the current mayor, Boris Johnson, came along. He is himself a cyclist (I describe taking a ride with him here – http://invisiblevisibleman.blogspot.com/2012/05/thoughts-on-electoral-cycle.html ) but he’s impatient and didn’t want to develop the complex, backstreet network. He’s consequently gone for the superhighways along main roads. Some of them are frankly terrifying. I certainly mostly stayed away from using the one that went to my office in busy morning traffic. The big advantage of being able to ride in traffic in London, meanwhile, is that one isn’t confined so much to narrow, painted cycle lanes at the edge of the street. I ride every morning down Clinton Street in BoCoCa and the lane is right in the door zone – the most dangerous bit of the road to use. In London, on such narrow streets, cyclists were encouraged to ride in the lane – and markings told motorists to expect them. Something similar is needed in New York. Dexter Ave in Seattle has this bus stop treatment too, on otherwise unprotected bike lanes. Seems fairly successful. How long until the charter meeting of Neighbours for Better Bike Lanes? Has Mr Miller visited London before writing this piece? Its really not surprising that cycle use fell – its beeen going up massively for 10yrs (the linked article says this) and last year was wet wet wet. The fatalities in E.London are very sad but should be set against the big rise in usage. Many of the cycle lanes are in bus lanes so the only traffic around are buses and other bikes, and for me the latter are the more dangerous. Copenhagen has many “floating” bus stops that place cyclists between a sidewalk and a concrete strip for bus loading/unloading. It works for two reasons: 1 – bus drivers are professional drivers, trained to be safe. 2 – pedestrians in Copenhagen have learned to look for cyclists before stepping in front of them. http://invisiblevisibleman.blogspot.com/2012/07/grids-lights-and-why-new-yorks-traffic.html The few roads in London with the volumes and speeds of traffic of the Manhattan avenues (and some big boulevards in outer boroughs) are mostly fairly easily avoided. The Manhattan avenues represent a challenge for cyclists that’s unique to New York and it’s not surprising that especially high-quality infrastructure is required to negotiate them. I really do not think that New York is setting an example for London. Cyclists there can easily take a ferry across the North Sea and see the vastly superior cycling infrastructure in The Netherlands. Then they run campaigns like “Let’s Go Dutch” and start the Cycling Embassy. In my opinion, Amsterdam should be the example for both New York and London. New York is miles ahead of London in this regard. However, it should be noted that it is much easier to introduce cycling infrastructure in US cities because they generally follow a regular grid layout with large boulevards copied from European cities like Paris. London’s road network requires more complex planning as the roads criss cross each other at odd angles so it is much harder to isolate one street for redesign. However, I hope London will look at the best practice and innovative schemes elsewhere in the world and invest more in cycling infrastructure. There is clear evidence that it makes a city a better place to live. London's new protected bike lane network has made Upper Thames Street much, much more efficient -- because it gave more Londoners a way to comfortably move through their city in a way that requires less public space.